Does Your First Car Make You More Likely to Buy the Same Brand Later in Life? I’ve had a few friends buy cars lately, and I had a random thought in relation to them: Does your first car make you more likely to buy the same brand later in life? Here’s the foundation for my theory: Every brand of car has a different layout for the controls and core functions. If you drive a car when you’re young, it’s ingrained in you that this is a car. This is how you turn on the high beams. This is how you adjust the windshield wiper. This is how you pop the trunk. So later in life when you’re scouting around for a car, vehicles within that original brand are going to feel more familiar and intuitive, while other brands aren’t. Take me, for example. 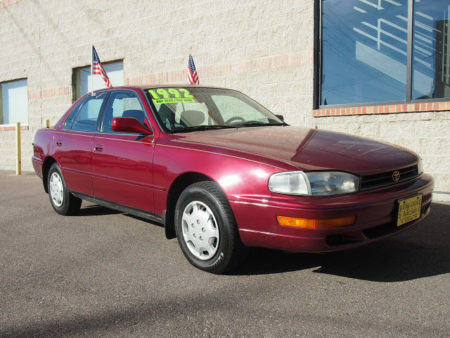 I didn’t have a car in high school, but my parents owned a 1992 Toyota Camry, and whenever I was allowed to drive, it was the vehicle I used. Years later I was in the market for a car. I tried several other brands, but they felt weird. Then I climbed inside a 2003 Camry, and I felt right at home. I’ve driven it ever since. I’m wondering if other people have the same experience. If they do, I wonder if any car companies focus their marketing efforts and special promotions on being the first car for teenagers. If the theory is true, then if you can be someone’s first car, you might be creating a lifelong customer. What do you think? What was your first car, and are you still driving that brand? This entry was posted on Monday, February 11th, 2019 at 9:34 pm	and is filed under question of the day. You can follow any responses to this entry through the RSS 2.0 feed. Definitely for me. My earliest remembrance of cars was as a boy my dad bought a 1947 Chevy. Then when I was in High School, my dad bought me a 1947…Chevy. Today I own a 2018…Chevy Cruze. And all. Through the years I was a GM fan – always loved Pontiac and Chevy. My first car was an AMC Hornet. Followed by a Buick LeSabre. Then Honda, Honda, Toyota, BMW, and now a Mazda. I finally have the one I really love. For me it’s more about the overall car ownership experience rather than familiarity or sentimentality. My first car was a Nissan Sentra (we looked at Nissan because my wife had very good good experiences with a Versa and Altima in the past) but it started having some costly issues after the warranty had expired (of course). So when it flooded during a freak thunderstorm a couple of years ago we decided to look elsewhere despite being familiar with Nissan. We settled on Toyota for its great reputation and I couldn’t be happier even if it meant having to familiarize myself with a new driving configuration. I can only hope it can last as long as yours! Familiarity is one thing but I’m always seeking to upgrade. Why buy the same car when you can get a better one? I find that I look for features that I liked in my first vehicle (’84 Toyota Pickup) and those that came after it in the vehicles I purchase. If I could buy that same pickup again I would without a second thought but it no longer exists. My favorite vehicle so far has been a Mazda 6s. It was far from perfect but when it was time to replace the 6, Mazda had changed it to the point it was no longer the car I loved so I went with something else. In 10 years when it’s time to replace the GTI I’ll probably be switching to something completely different again…assuming we still have personal vehicles at that point. Not me. My first car was such a piece of junk, I never wanted to drive that brand again. The car I learned to drive on was a Saturn. The first car I owned myself was a Pontiac. My wife’s first car was a Pontiac too. Womp Womp. We replaced one of the Pontiacs with a Honda Civic. Then we later replaced the other Pontiac with a Subaru Outback. When the civic died, we got a Subaru Impreza. So we’re a double-Subaru family. It’s very snowy in Wisconsin this year, and I’ve never been happier with our choice. I think we’re likely to keep driving Subarus for the foreseeable future.